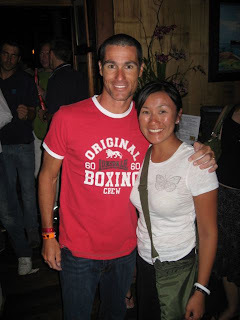 IronYi........: The 2008 Ironman World Championships! 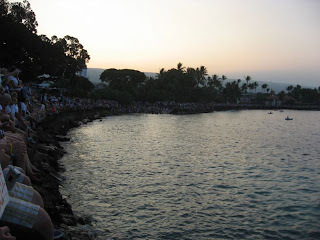 Kona from a spectator's view! 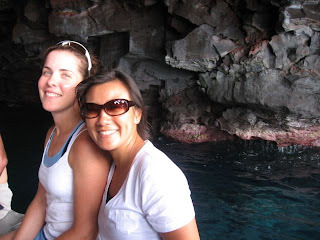 Kara and I arrived in Kailua-Kona on Wednesday, October 8th. The race was set for Saturday! 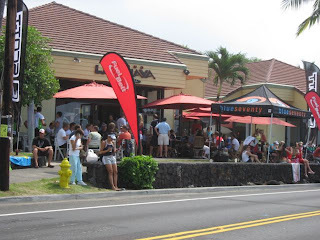 Days leading up to the race, we roamed the expo many times, athlete watched at DigMe Beach (swim start), hung out at the place to be- Lava Java. Our condo was on Alii Drive and on any given day, we can see Pros running up and down the streets, we saw Macca being motor paced the day before the race, and just a lot of action going on. Chris Lieto and Normann Staddler seem to be Lava Java regulars, shiny bikes everywhere you looked, not to mention shiny smooth legs :). I thought since this isn't an event that I am doing, I wouldn't spend too much. I was clearly wrong! Ironman 30th Anniversary book- gotta have! 2007 World Champs DVD- must have! Gear that I can almost never find back in the Bay Area- should buy. Gear at a discount due to event- must take advantage of deal! A lot of events take place before the race. Pros autograph signings, speakers, UnderPants run you see pictured below..nothing like tighties and compression socks! Smooze parties which Kara and I got into thanks to Whit. The day before the race, the athletes are dropping off their bikes and bags. Guys are lined up in front jotting down the makes and brands of every main bike part from the materials, to bike frame, to saddles, pedals, handlebars, you name it, they tallied it! I always thought that they had a more high tech system but I guess not. 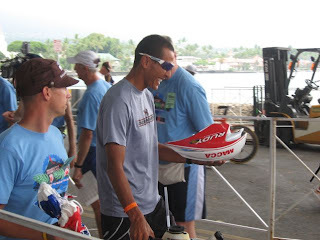 Pic below- 2007 World Champ, Macca looking relaxed as he is dropping off his gear. saw Desiree Ficker get sent back because she didn't have her race number on her helmet. 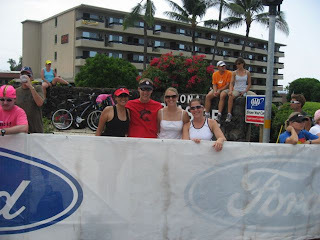 We saw Faris, TJ, Andy Potts, many AGers and many shiny nice bikes. Speaking of bikes, I think the most interesting thing to see was how people had their bike set up. How many bottles they had, how they chose to carry their gear. This one bike had both sides of the frame taped up and in between was all his stuff..tubes..pump..you name it..it was probably in there! The experience was made much more comical because Mike was there too commentating on everything! So race morning comes. Kara and I wake up at 3am to get down to the swim wall by 4am to get a front row seat to the swim start! As 4:45am approaches, we see more and more athletes make their way to the start. Among those, we saw Normann Staddler, friends Lydia and Adam. By 5am..the wall was full of us spectators! As the Pros are entering the water for a warm up, we see everyone swim up towards the swim line but there was one guy who decided to swim left instead of straight- it was Andy Potts who found his support crew in the crowd. 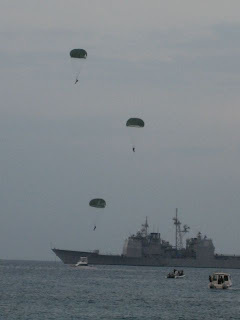 Before the start gun goes off, the Navy Seals are seen dropped from the plane. That's their version of "walking to transition". It's a sight to see! None of my pictures will do the atmosphere any justice! As the swim got underway, Chris, Michela, Kara and I made our way to the "hot corner" where four way traffic of bikes and running shoes will come through! We saw Andy Potts, who had a blazing fast swim come through on the bike first followed by the 1st leader pack which included Macca and then Normann and then Lieto. Followed by that was hours of cowbell ringing by yours truly along with loud cheers! Midway through the bike, we heard that Macca had dropped out because the front derailluer cable of his bike snapped. Bummer!!! They showed him on the jumbo-tron and he just looked so frustrated. About an hour and a half before the 1st Pro was to finish, we made out way to the finish line bleachers. The crowd at the finish line is just electrifying waiting in anticipation. We see the helicopter getting closer and closer. We see the Hawaiian drummers come through and following them was Craig Alexander aka Crowie! 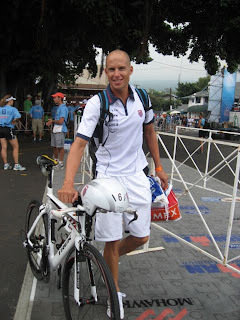 He was 2nd last year in his first Kona debut and here he was- 2008 World Champion! He took his time and savored the finish chute experience! Following him was Llanos and then Rutger Beke! I am glad that Beke did well. He finished 4th in 2006. Last year, he had to walk the marathon and finished just under 900th place and when asked why he was walking? He said, "He won't DNF a race unless for medical reasons." He will say later that it's due to respect to us age groupers. How can you not support that right?! Normann Staddler, Chris Lieto, Torbjorn Sinballe, all the Pros that came through just looked relieved to finish! Matt Lieto came through the finish line bursting into tears. It was endearing. Chrissie Wellington won the female race margins and margins! We stayed out until the last person came through 3 minutes after mid night! The whole event is great to watch but to me personally, the largest symbol of the Ironman Spirit happens between the hours of 11pm to midnight. Seeing those athletes push through to do whatever necessary to get to that finish line- inspiring! 18 year old, 75 year old, our friend Lydia who barely made the bike cut off all came through with minutes to spare to the 17 hour cut off..it was a pleasure to witness! 1:30am..bed time! The morning after the race, Kara, Whit and I are set for our snorkeling trip with Chris. On our boat was a handful of Germans which included the first amatuer to finish the race. Unfortunately, he finished right behind Chrissie Wellington so he didn't get the cheers and the announcer excitements that one should but he handled it quite well and politely at the finish. Chris took us out to this cover in the waters, we got our snorkels out and jumped into the water. 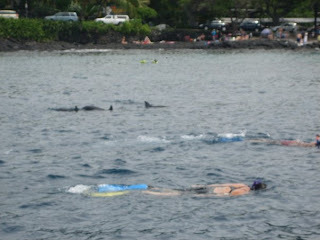 Just when I was getting bored, I see dolphin fins about 200 yards out. I tried to kick my way over but it seemed like the more I kicked, the further they were getting. As I was about to give up, I looked down and there they all were!! There were about 50+ of them under water! Next thing you know, they're all around us! After snorkeling, we attended the awards dinner which was quite fun until it starting raining while the Hoyts were speaking. Rain turned into down pour shortly and that's when the awards dinner wasn't so fun anymore but I stuck through it until the sound system went out during the Pros awards. That's when I made my way to the KSwiss after party! Below- a picture with Crowie. My Kona vacation is now complete :). Crowie without hair is starting to grow on me! So the common question..do Ironman athletes have it tougher or do the spectators? I would say it's sort of equal. Mentally, I think the athletes have it tougher because an Ironman could be 17 hours of a mental f*ck! Physically, I think the spectators have it tougher. The athletes towing the line are trained to do so..spectators aren't necessarily "trained" to be out there for that long..in the sun..probably not eating and hydrating as often as one should. At the end of the night, my feet were more sore from the 17+ hours of spectating and cheering than they were from finishing my Ironman! Go figure! Kara and I saw Macca with his family during our last run to Lava Java. Word has it that Macca is pissed angry about having to pull out of the race. If I were his competitors, I'd be frightened for next year! 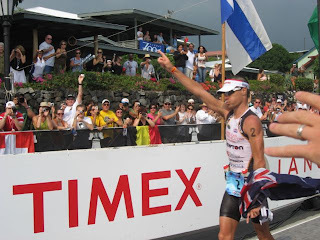 Looking forward to the 2009 World Championships in Kona already! Thanks to Kara for a fabulous week!